Therto he song som tyme a loud quynyble." The use of a bow on stringed instruments probably originated in central Asia during the ninth century, spreading through Islamic and Byzantine territories and later reaching western Europe in the tenth to twelfth centuries. Bowing may have developed in an attempt to create an instrument which could imitate the voice. Bowing gave stringed instruments the sustaining power necessary to play a continuous melodic line. Nevertheless, the status of these bowed instruments and their players remained low. The rebec was definitely an instrument of the lower classes, not the court. The rebec (rebeca, rebecq, rebet, ribeca, rebecum, rabel, or rebequin) came from the Arabian rabob. It has been known in Europe since the 10th century but their use in art music was chiefly during the Middle Ages and Renaissance. The rebec's rounded pear-shaped body is carved from a single block of wood and tapers in such a way that there is no visible distinction between the body and the neck. 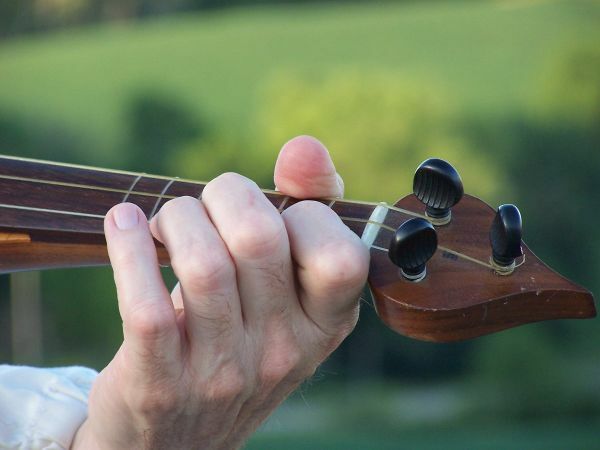 The fingerboard is a raised part of the soundboard or is fixed to it from above, but this does not change the frontal outline of the instrument. Early rebecs had no soundpost and the pegholder is flat. 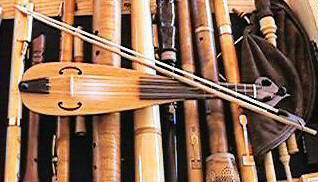 As with most early instruments, rebecs came in many sizes and pitches and although the number of strings on early rebecs varied from three to five, the three-stringed rebec seems to be the most popular. In the Middle Ages the most common rebec was the soprano, played by resting it on one's shoulder, across the chest, or in the armpit. 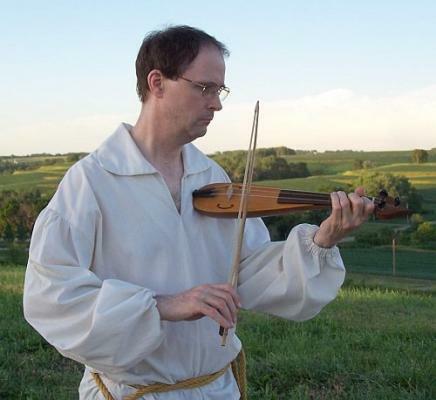 The instrument often has frets, and probably had a thin nasal, penetrating tone, Rebecs are associated with secular intrumental music, especially dance music, and their role in the latter continues to the eighteenth century. Remnants of its tone and style can be heard in the country fiddling of the United States. Musica Antiqua's soprano rebec was built by Hart Workshop.